Now as per the orders of Directorate (IR Division), all the Urgent IFS Money Orders are to be downloaded by entering the Money Order Number alone. It was also ordered by Directorate (IR Division) that there should be provision to return an Urgent IFS Money Order, if there is mismatch between the Payee Names as available on the Money Order form and the ID Card produced by the Payee. Accordingly suitable software modifications have been done in eMO Clinet and Postman modules. Hence this release. a) Update-8 to Meghdoot 7.0 available in ftp site at ftp://ptcinfo.org/Meghdoot7/Updates/. Ø All eMO Delivery Post Offices have to implement this patch. Ø Please take backup of all related databases after completion of the day’s work before proceeding for going for up-gradation of this update. Ø Replace existing Postman.exe with new one. Ø Replace existing EMODelivery.dll with new one. Ø Replace existing EVPDelivery.dll with new one. Ø Replace existing eMOClient.exe with new one. 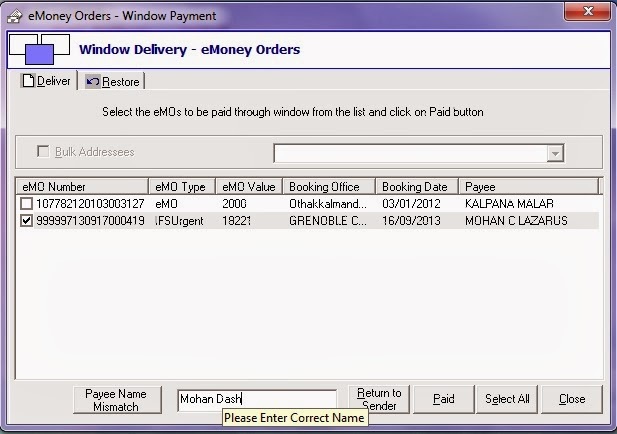 The Urgent IFS Money Order printed in eMO application will be available automatically in Window Payment screen. 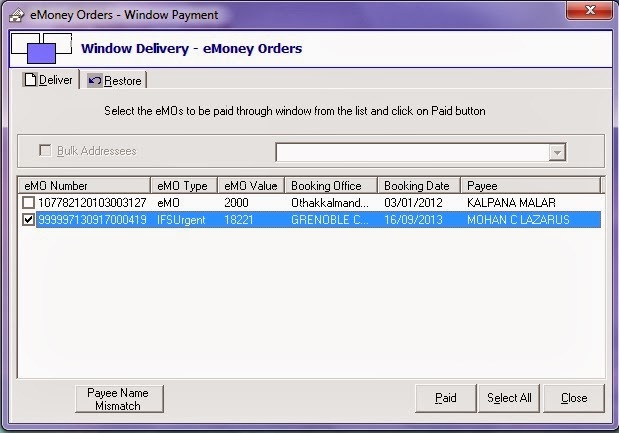 Hither to, ‘Paid” is the only option available in r/o Urgent IFS Money Order in Window Payment Screen. 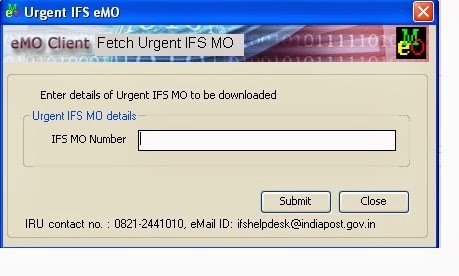 In order to handle the situation where the Postmaster observes mismatch between the Name available on the Printed IFS MO form and that available on the ID Card produced, a new option “Payee name Mismatch” is provided in Window Payment Screen of Postman module in order to return such Money Orders unpaid. If the Postmaster want to return the Money Order due to mismatch in the names as mentioned above, the “Payee Name Mismatch” option has to be clicked. 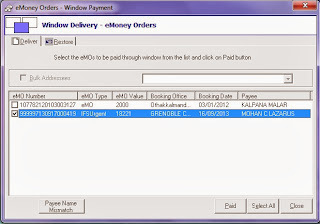 On clicking the same, a blank text box appears for entering the Payee Name as available in the ID Card. 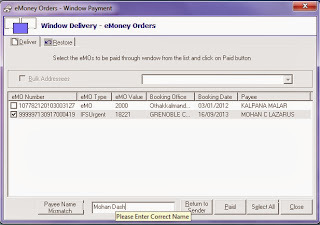 The Operator has to enter the Payee Name as available in the ID Card and click on “Return to Sender”. Then the Money Order will be returned to Sender (after Window Submit Account).